A tent blew down overnight, the men stayed in the folds, 2" of snow cover by morning, others were woken by the sea lapping at the tent edge. Awful day, the James Caird to be used as a tent, 2hrs to scrape the ice and snow out, nearby penguins had enough of the weather and left. Some are showing signs of demoralization, most not up until after 11a.m. a day gathering penguins in a blizzard that is getting worse. The physical and mental condition of some of the men is cause for concern, a boat journey is needed, no-one will look for us on Elephant Island. 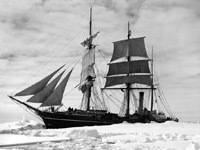 Shackleton is to make for South Georgia, 800 miles in the direction of the prevailing winds, he and 4 others including Worsley will take the James Caird. McNish and McCarthy are strengthening the James Caird, adding decks of canvas and salvaged wood, oil paints used for caulking, impeded by the blizzard. 5th day of blizzard without respite, a tent cooker blew away to sea, unusually high tide, up in the dark to pull 2 boats higher up the shore. We have called our position Cape Wild, it is living up to its name, we are the first to set foot on this island. The James Caird is ready for launch as soon as the weather permits it, crew of Shackleton, Worsley, Crean, McNish, McCarthy and Vincent. ...she rolled dumping McNish and Vincent in the sea, Worsley noticed her plug was out and she was in danger of sinking. 100yds offshore, using the "Wills" as a tender, ballast, provisions, etc. were loaded, then drama as the Wills nearly lost. 3 cheers from us and they were off, tiny boat on the open stormy ocean, they should make S. Georgia in 14 days. Shackleton party are now split, so Tweets will be prefaced by location as they progress. 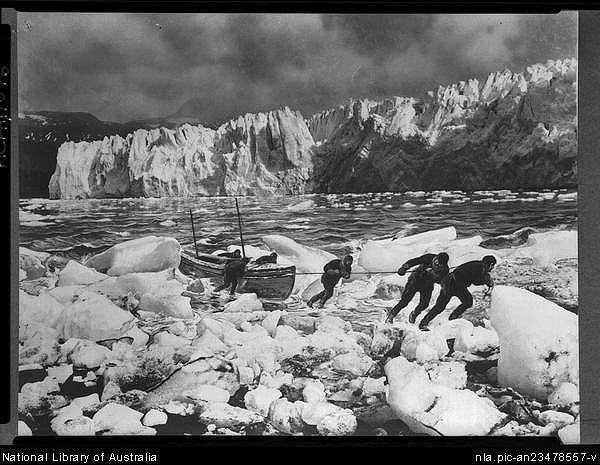 Elephant Island - Bay filled with pack, Shackleton left just in time. 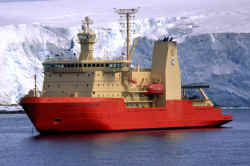 Orde-Lees and Wild at odds over catching penguins for food, Wild expects rescue in 14 days or so. James Caird - ...and runs down necks and backs, briefly it is warmed but 1/4" movement means contact with cold wet garments on the sides, sit still don't move. 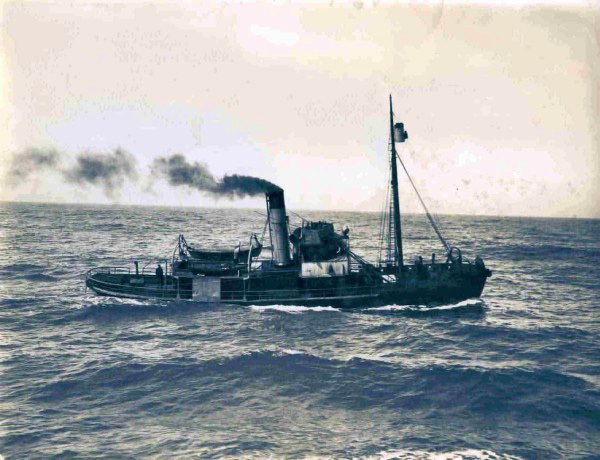 James Caird - 45 miles out, a cross sea is tumbling us about, 2-3 buckets of icy sea come over us with each motion, at least it helps stop seasickness. James Caird - We have been wagged like a dog's tail, shook like a flag in a gale and switchbacked over hills and dales. We are sore all over. 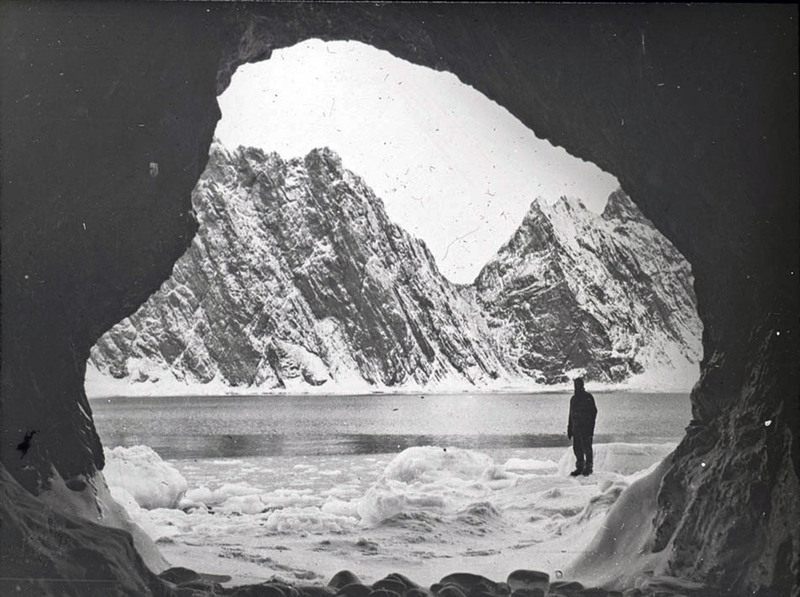 Elephant Island - Wretched weather cold and rain, "This truly is a land where nature shows but her sullen moods", the position of nightwatch now abolished. James Caird - Worsley took an observation of the sun, a man each side holding him in place, all kneeling as the boat tumbled, good headway being made. 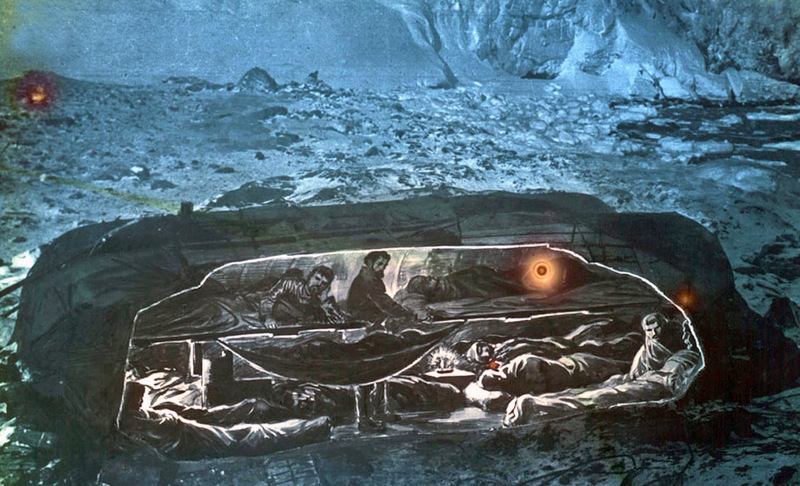 James Caird - We crawl in semi-darkness under the decking, knees on ballast stones. The darkness is complete by 6pm, no light again until 7am. James Caird - Meals are our bright beacons in the cold and stormy days. The glow of warmth and comfort from the food and drink makes optimists of us all. James Caird - Part of our canvas cover has gone, this has curtailed the "saloon" but enlarged the "cockpit" easier to look out and appreciate the view. Elephant Island - We have built a hut, low stone walls using the two boats as a roof, we are all very weak for this laborious work. Elephant Island - Blizzard in the night helpfully showed where the hut is not weathertight, we woke up with a 6" covering of snow (inside it). James Caird - More 3 dimensional boat cavorting, these are the largest ocean swells in the world, 40-50ft from crest to hollow, 400-1000yds+ long. James Caird - Our boat takes most waves end on, the crests often curl right over, looking out we see a tunnel form as the crest of a big wave topples. James Caird - Made 92 miles yesterday, 78 today. Gale, sea and cold increased, took in the sails stored them below, riding the gale on the sea anchor. James Caird - Ice building up, had to dump 2 oars as they caught so much ice. Drank the black, smelly, seal oil we had to calm the sea for its calories. 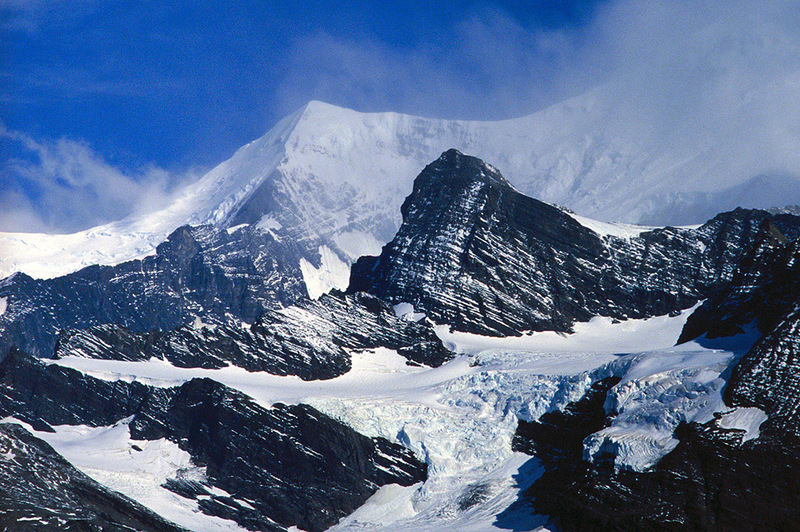 Elephant Island - Brought stove into hut and stank it out with rank blubber smoke, bad idea. Weather meant partial drying possible. Bagged 70 penguins. James Caird - The gale is holding, difficult to write. 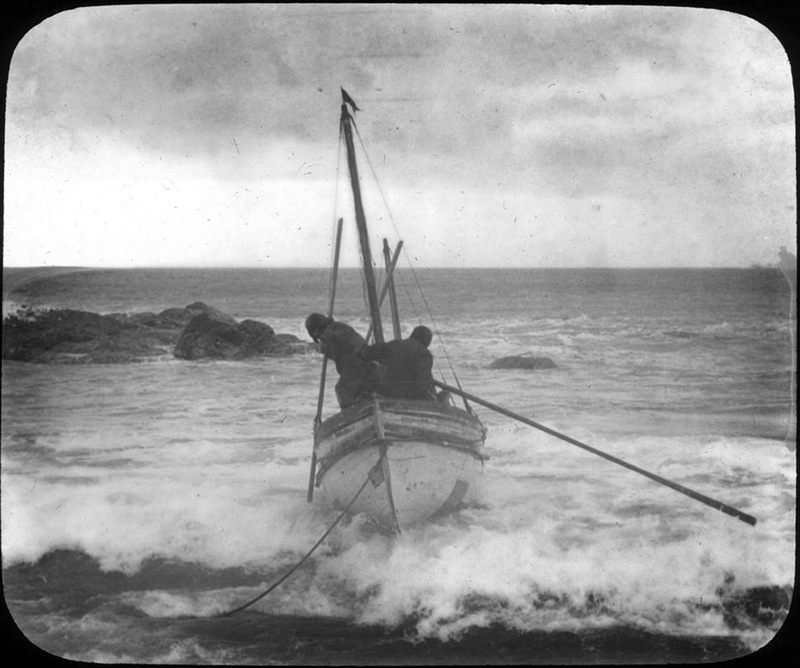 All is wet, sleeping bags on the edge of fermentation, oh for a hot bath, clean dry clothes..
James Caird - Boat riding deep with weight of a 15" casing of ice, threatening to capsize, took it in turns to crawl out and hack it off, 4-5mins each. James Caird - Ice at the bow has chafed the rope to the sea anchor and we have lost both, it seems a disaster, our fierce gale has lasted 48hrs so far. 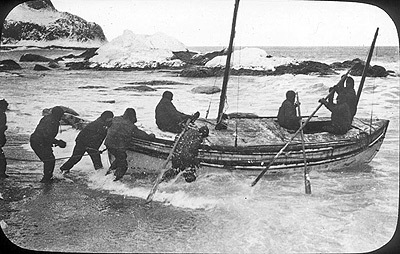 James Caird - 3 times we have each had to crawl on top of the boat to hack and scrape away ice build up, all agree it is the worst job of our lives. James Caird - McCarthy at being relieved at the helm, boat iced over and seas pouring down our necks "It's a foine day sorr" an irrepressible optimist. James Caird - Worsley was cramped after a spell at the tiller, dragged him below massaging him so he could unbend himself and get into a sleeping-bag. James Caird - Shackleton shouted "It's clearing boys - For God's sake hold on! It's got us!" what he thought was the sky was the crest of a huge breaking wave. James Caird - The boat was flung like a cork, the world became one of white foam, we baled for our lives, slowly we felt the boat live again beneath us. James Caird - A reading from the sun puts us at 444 miles, over half way. The first good day since we left, managed to dry sleeping bags, now damp not wet. Elephant Island - We have only a small area to walk about, to warm our feet especially, one always meets the same people, they are so dirty looking too. James Caird - We are about 100 miles from South Georgia, maybe 2 days away. Mouths dry, tongues swollen we must conserve the little water we have. James Caird - Time passes in a sort of nightmare, thirst is all, hoosh twice a day with one cup of hot milk in the long bitter watch of the night. James Caird - We passed a small piece of kelp and then a large mass with 2 shags, a sure sign that land is within 15 miles, the sea is lumpy and wets us. James Caird - "Land ho!" a black crag seen by McCarthy through flying spume and mist, foolish grins all round. Rocks make waves break foam to 30-40ft. James Caird - Cannot land, heavy sea, hidden reefs, unchartered shore, we hove to overnight 18 miles offshore, a hard gale, snow, sleet - disappointment. 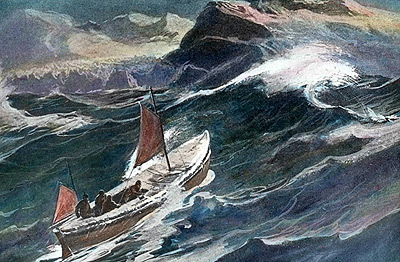 James Caird - Wallowing in a terrible sea, mountainous swell and furious winds conspiring to take us to our destruction. James Caird - Noon - the gale has risen to hurricane force, we rapidly scan the coast when we rise on the towering swell, almost becalmed in the hollows. 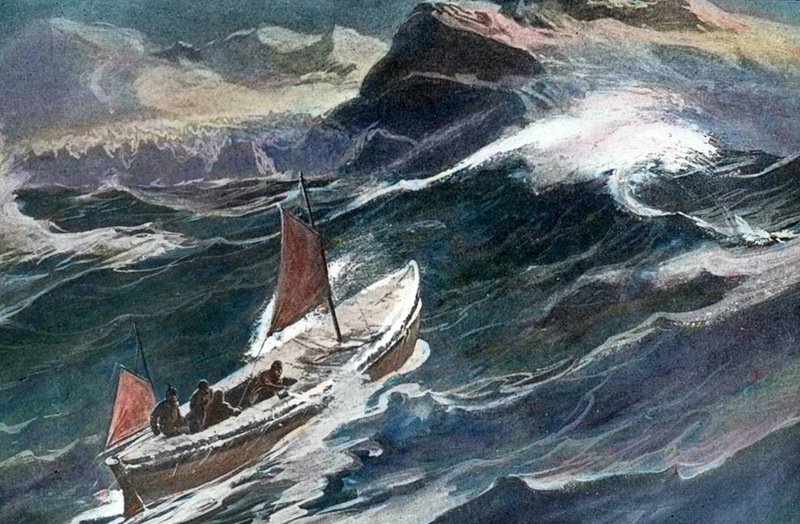 James Caird - The boat fell, planks opened and lines of water spurted through every seam, halt, tremble and again! 1 steers, 4 pump and bale, 1 stands by. James Caird - For 3 hours we have looked death square in the eye. At which spot on the hellish rock bound coast will our end come? Thirst almost forgotten. 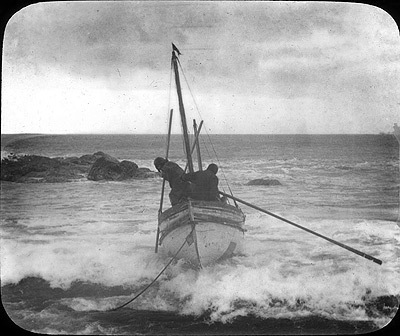 James Caird - Darkness settled, the wind abated, for 9hrs we have fought a hurricane. We freed the boat of water, thirst returned and we were able to sleep. James Caird - Struggling to get some ice to drink, and to shore against the wind and tide which are too strong to row against, had a poor breakfast and no lunch. James Caird - Tacked into the wind 4hrs, made no gain, by sheer hard rowing as well, we drew nearer. The wind blows stronger, we may be driven to sea again. James Caird - Evening arrived, we saw a cove with a possible landing, we beached as it got dark and fell into pools of running water, we drank and drank. James Caird - Clumsy with cold, exhaustion and swollen numb feet we emptied the boat. Hot milk, hot hoosh, up half the night saving the boat from the sea. 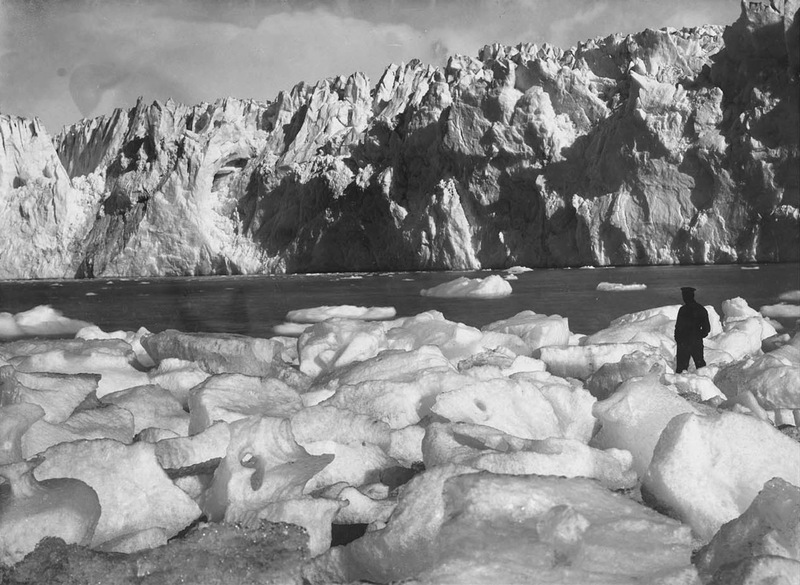 James Caird - King Haakon Bay South Georgia - camped in a cave fronted with 15ft icicles, fireplace, beds of grass, we feast on albatross chicks and recover. Ernest Shackleton - Must push on to Stromness, 22 men are waiting for rescue, the James Caird is weakened and the rudder lost when landing. South Georgia - Shackleton and Worsley went to scout the area and determine our next move, they returned with seal blubber and liver, treasures indeed! South Georgia - Making preparations for an early start tomorrow, we cannot strike inland from our landing and must move around the coast before we do so. South Georgia - Launching the boat sighted our rudder in the surf, returned capriciously as it was taken a few days ago, set off singing like a picnic party. South Georgia - A fine day, bowled along at 7kts, action again! Landed next to 1/2 acre of driftwood, 4-8ft high in places, plentiful sea elephants for food. South Georgia - We call our upturned boat Peggoty Camp covered with tussock and moss it looks like an Irish turfed hut, small sled made for the crossing. Elephant Island - Our bay fills and empties with pack regularly, penguins abundant, if it freezes our food supply could disappear. South Georgia - Another stormy day, we need fine weather and the moon full as it is now to attempt the 17 mile crossing, anxious we may miss the window. South Georgia - Shackleton Crean and Worsley to make the crossing, McCathy to stay with Vincent and McNish who are still weak from the boat journey, we wait. South Georgia - Prepared gear, hauled sledge to starting glacier, too heavy so left it, McNish put brass screws from the boat in our boot soles for grip. South Georgia - Set off tomorrow, no-one has ever ventured more than a mile inland on SG. McCarthy the only well man remaining, the others are incapable. South Georgia - Up at 2am, hoosh and off under the moon and clear sky, heavy going as we sink to our ankles in snow at each step. South Georgia - Daybreak, 3000ft up headed down to a huge fog-edged frozen lake, light revealed it to be the sea, about turn, 2 hours to regain our position. South Georgia - We travel over an undulating sheet of snow and ice, spacious grandeur, clear air, silence other than the crunch of snow and swish of rope. South Georgia - Rare sensation of uncomfortable heat as the sun beats fiercely on the blinding white snow-slopes, must lose height before the fog catches us. South Georgia - Pressed on by fog, cold and closing dark down a steep slope, we slid the last part, never so scared in out lives! lost 2-3000ft in 2-3mins. South Georgia - Trousers suffered the most, now in rags. We continue through the night, Shackleton insists on breaking the trail, his teamwork is pulling us through. South Georgia - 5am huddled together to sleep, Crean, Worsley gone in a min Shackleton stayed awake, woke them after 5min and said it was 30 the effect was the same. South Georgia - A steep slope and a gap in the jagged peaks, Stromness Bay 12 miles away, no chance of losing our way now, it was 6.55am. South Georgia - At 7a.m. the whaling station whistle, Shackleton - "Never did music sound so sweet to our ears as that whistle", we shook hands, men, ships, rescue! South Georgia - ...a detour of at least five miles before we reach level going What shall it be?" Both at once, "Try the slope." more trouser damage ensued. 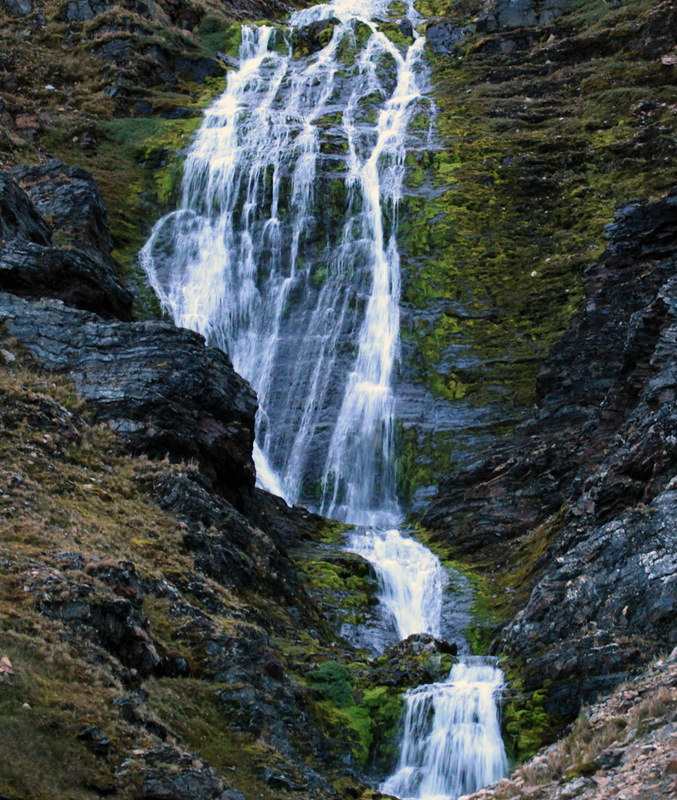 South Georgia - 1.15pm, 3000ft, looking down to Stromness Bay, down a valley and through the beastly icy cold water of a stream, we came to a 50ft waterfall. South Georgia - Going back unthinkable, we fixed the rope and one by one lowered through the falling frigid water, shivering but hearts singing, just 1.5 miles. South Georgia - Beards long, hair matted, unwashed, tattered and stained clothes worn for nearly a year, unwittingly scared off two small boys and a old man. 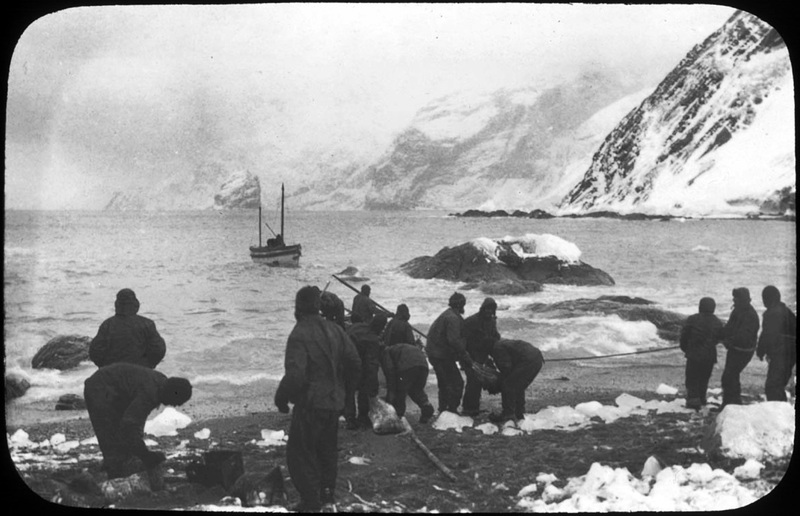 Ernest Shackleton - "We have lost our ship and come over the island - My name is Shackleton" - Mr Sorlle's hospitality had no bounds, food, clothes, warm, clean. Ernest Shackleton - "We had seen God in His splendours, heard the text that Nature renders. We had reached the naked soul of man." - Ernest Shackleton. South Georgia - Worsley sailed with a whaler to Peggotty Camp for McCarthy, McNish and Vincent who didn't recognise him spruced and shaven until he spoke. 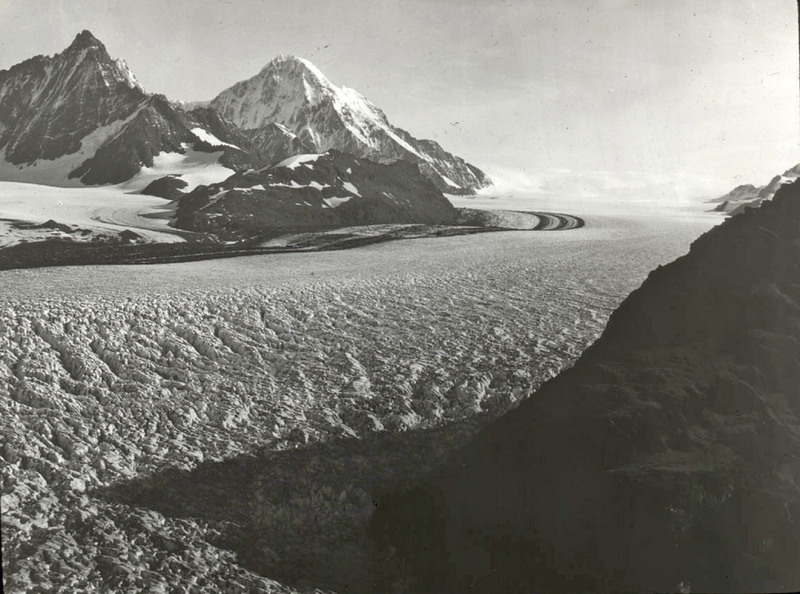 South Georgia - Shackleton arranged for whaler Southern Sky to go to Elephant Island. The Norwegians all wanted the honour of hauling her up for Shackleton. 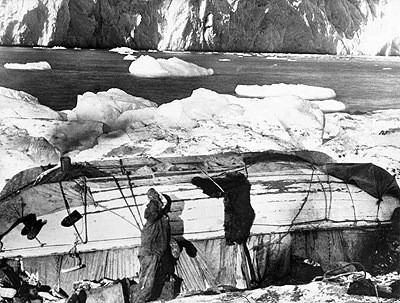 South Georgia - pm - delegation of old captains and sailors spoke, in 40 years never had they heard such a tale of the journey from Elephant Island "These are men!". Elephant Island - Every morning Wild starts with "Lash up and stow! Roll up your bags boys, The Boss may come today." - the food we brought is running out. South Georgia - 9am Shackleton sailed on the Southern Sky to rescue the stranded men, uneventful at first though the temperature fell from noon onwards.